Chilapata Wildlife Sanctuary is located in the heart of Eastern Dooars at the Himalayan foothills. It serves as the corridor between Buxa Tiger Reserve National Park and Jaldapara Wildlife Sanctuary for Asian elephants and One Horned Rhinos. It is only 20 kilometers from Alipurduar and is an hour’s drive. Mendabari Jungle Camp is the eco tourism resort of Chilapata Forest. The camp is 2 kilometers inside the forest in Kodal basti or settlement and provides a once in a lifetime opportunity for adventure lovers to stay amidst vast jungle accompanied by wild animals 24 hours. If you wish to be thrilled to the core, this place is for you. 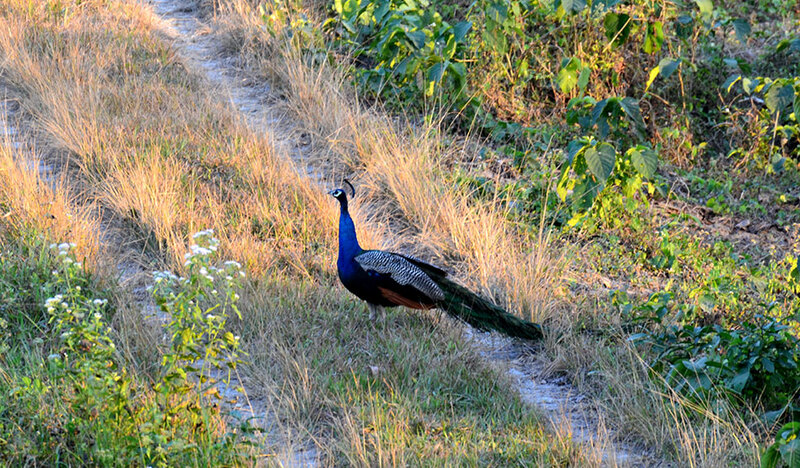 Chilapata Wildlife Sanctuary and Mendabari Camp are accessible through road, rail and air. You have to take National Highway 31 to reach Chilapata if you are driving your car. By air you have to come to Bagdogra airport from where you can hire a taxi to take you to Chilapata. The easiest is however boarding a train and disembarking at Alipurduar station from where it is only an hour’s drive to Chilapata Wildlife Sanctuary. The Mendabari Jungle Camp is 2 kilometers inside the forest. Mendabari Jungle Camp reminds one of the rural lives of our ancestors. It is absolute bliss and also undaunted thrill that you will experience here. The Elephant cottage is made with cement, brick and wood in local style standing on concrete stilts while the Bamboo cottages are more authentic ones made from eco-friendly materials capturing the traditional architecture of the tribal houses. Food is prepared from the fresh organic local produce and offers different varieties of local the local cuisine. It is served on thatched dining tables with 4 sides open to enjoy uninterrupted view of the jungle. However, you are not allowed to go out of the cottage at night on bare foot because leopards have been noticed in the zone. The Elephant cottage cost 1500 INR and the bamboo cottage comes at 1000 INR. Food is charged separately. Chilapata Wildlife Sanctuary is home to 23 species of herbivores and carnivores and around 22 species of reptiles and 180 species of birds. Some rare orchids and trees and plants are found in the forest as well. This diverse flora and fauna is nurtured by the rivers Torsha and Bania which bring in the fresh monsoon alluvial soil. Apart from Asian elephants and one horned rhinos, sambar, barking deer, wild boar, hog deer, cheetal, leopard, and monkey can be found in the forest. You will be able to spot majority of these animals from the Mendabari watchtower on wildlife safari. Jaldapara Wildlife Sanctuary and Khyerbari Leopard Rescue Center are close by. Mathura Tea Estate and Rabha Tribal community are the other tourist attractions near the forest. Deep within the forest lay the ruins of the fort of Nalraj. The historians are divided on the era of its construction and trace it back to 5th -7th century. Only the entrance of the fort is now visible. While returning back you will see the ‘bleeding tree’ known as Ran Guna. Other activities include baoting on Bania River, angling and trekking the jungle trails. This entry was posted by indispottravel in Dooars in West Bengal, Forest Bungalow in West Bengal, Jungle Safari in West Bengal, Weekend Destination around Kolkata, West Bengal, Wildlife in West Bengal and tagged Accommodation in Chilapata, adventure tourism, Asian elephant corridor, Attractions & Activities in Chilapata, Bamboo cottages, baoting on Bania River, bleeding tree, Buxa corridor, Buxa Tiger Reserve national park, car available for Chilapata, car rent to Chilapata, Chilapata, Chilapata cost, Chilapata Wildlife Sanctuary, corridor between Buxa Tiger Reserve National Park and Jaldapara Wildlife Sanctuary, corridor between Buxa Tiger Reserve National Park and Jaldapara Wildlife Sanctuary for Asian elephants and One Horned Rhinos, cost of Chilapata, cost of Elephant cottage per night at Chilapata, distance of Chilapata from Alipurduar, distance of Chilapata Wildlife Sanctuary from Alipurduar, distance of Chilapata Wildlife Sanctuary from NJP, distance of Chilapata Wildlife Sanctuary from Siliguri, dooars, dooars in west bengal, doors north bengal, dours tour, eco-friendly tourism, Elephant cottage, Elephant cottage cost, foods at Chilapata, Forest, forest bungalow Chilapata, forest camps in Chilapata, fort of Nalraj, hotels in Chilapata, how many species of reptiles exists in Chilapata Wildlife Sanctuary, how many species of reptiles exists in north bengal, how to go to Chilapata, how to go to Chilapata Wildlife Sanctuary, how to go to Mendabari Camp, how to reach Chilapata, how to reach Chilapata Wildlife Sanctuary, how to reach Mendabari Camp, Jaldapara Wildlife, Jaldapara Wildlife Sanctuary, jungle, jungle safari, Kodal basti, location of Chilapata Wildlife Sanctuary, location of Mendabari Jungle Camp, Mathura Tea Estate, Mendabari Jungle Camp, Mendabari Jungle Camp is the eco tourism resort of Chilapata Forest, night stay at Chilapata, north Bengal, One Horned Rhinos, One Horned Rhinos corridor, Rabha Tribal community, Ran Guna, resorts in Chilapata, Rhinos, room tariff at Elephant cottage, staying options in Chilapata, taxi to Chilapata, Trekking, trekking the jungle trails, West Bengal, Wildlife at Chilapata.